The SPEA On The Rhine program is for students interested in Public Policy and Administration in the European Union, Germany, and the United States. During the program, we typically had class between Monday- Friday and during the weekends we would either have a group excursion and/or time to explore. My study abroad experience is one of the best experiences I have ever had in my life. I definitely will go back someday! My study abroad program was above and beyond of what I expected! Prior to the program, I knew we were going to go to the European Parliament, Council of Europe, Committee of the Regions, and the European Central Bank, etc. but nothing seemed real until after I came back to the United States. In the classroom we learned about all the moving parts that make up the European Union and afterwards we would venture off to some of these places to learn more about them. 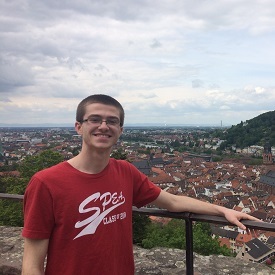 During the SPEA on the Rhine program, hosted in Germany, we participated in five seminars taught primarily by English speaking German professors. It was extremely unique to be taught from a different perspective. What was your first impression of studying abroad/initial thoughts on arrival? I was extremely nervous for my first time on a plane as well as traveling alone to a foreign country. Since neither of my parents have been on an airplane, I asked a friend to assist me with buying my plane ticket. Instead of a direct flight, my friend insisted it would be cheaper to make stops before arriving at the final destination. When it was all said and done, I took three planes and three trains to get to Speyer, Germany. This was a perfect route for someone who has never traveled alone in a foreign country. After never closing my eyes for 36 hours, I was very excited to relax and enjoy all of the pleasures my study abroad program had to offer. One of my favorite memories would have to be going to a EuroCup game with one of my friends, which was located in Paris, France. We watched the Iceland and Austria game. I thought I knew sports fans, but the Europeans take their energy and excitement to an entirely different level. I strongly believe my study abroad experience allowed me to strengthen my problem-solving skills as well as enhance my understanding of a culture other than my own. I am forever grateful for the opportunities that IUPUI gives to it’s students. They go above and beyond for their students and I am proud to call myself a Jaguar. Go Jags! If you could sum up your study abroad experience in one sentence/quote, what would it be?